The bent press is an amazing exercise, but I’ve found that there’s very limited information and training on how to effectively perform it. The more I learned and discovered about this lift, the more incredible and powerful it’s become for me. I hope you’ll discover this lift, as well. It’s like anything else that appears difficult. It seems much easier if you break it down into bite sized chunks. That’s exactly what I did for you in this 3 part video series. This video series will take you step by step through the progressions to build and develop this phenomenal total body exercise. It’s incredible for many reasons. If you want to know why the kettlebell bent press is such a tremendous exercise, definitely read 7 Powerful Reasons To Consider The Kettlebell Bent Press. Here is the 3 part video series. In this video, I’ll show you the 1st 4 progressions for mobility and movement that are required for the bent press. No weight or kettlebell is required here, it’s all about building the movement pattern and improving hip mobility. 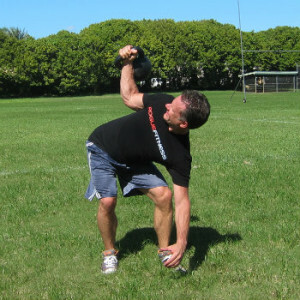 In this video, we build on the progressions from video 1 and we start to load the movement with a light kettlebell. There are 5 progressions to learn in this video, so take your time to learn them. Practice what you need to work on to effectively build and develop the bent press. This is the 3rd and final video in the bent press series. There are 5 more progressions here and a full demo of a weighted kettlebell bent press at the end of the video. If you’re looking to develop the bent press, there are many useful drills and progressions in these videos. If you want to learn how to maximize this lift for outstanding strength, mobility, and performance, watch these videos and practice the drills to improve your skills. Remember, nothing substitutes for “live” coaching. Subscribe below now or go to RdellaTraining.com/join to get your FREE Report, Kettlebell Impact with 12 Powerful Kettlebell Workouts.